I'm new here and I've recently started playing around with Arduino in order to add lights and sound to my model kits. So far I'm pleasantly surprised how easy it was to setup a working DFPlayer on an Arduino Uno. But, when I tried the exact same setup linked to an Arduino Nano, I can't get the DFPlayer to play anything. printDetail(myDFPlayer.readType(), myDFPlayer.read()); //Print the detail message from DFPlayer to handle different errors and states. 2.Please insert the SD card! So it looks to me like the DFPlayer works at least in some part. Since this exact same setup and code work flawlessly on my Uno, I wonder if anyone can tell me what is wrong here? Make sure it is pressed tightly in. To get it out, press in again and it pops out. The card is inserted correctly. Without touching the card but switching to the Uno (using the same DFPlayer module) it all works flawlessly. OK so I'm embarrassed to report that the issue was related to one of the wires of the resistor not being connected correctly between pin 11 and the Dfplayer .. All works great now! Is the Nano a +5v one? Or a +3.3v one? Wonder if its not getting enough current? OMG thank you for posting this. I had a similar problem with Arduino nano and DFplayer: Playing mp3s via software worked with Arduino uno, but not with Arduino nano. With the example code (and all other sketches) speaker produced noise and popping noises and software serial reported com problems. As I stumbled over this thread while searching for an answer, I'll document the result here as well for future reference. 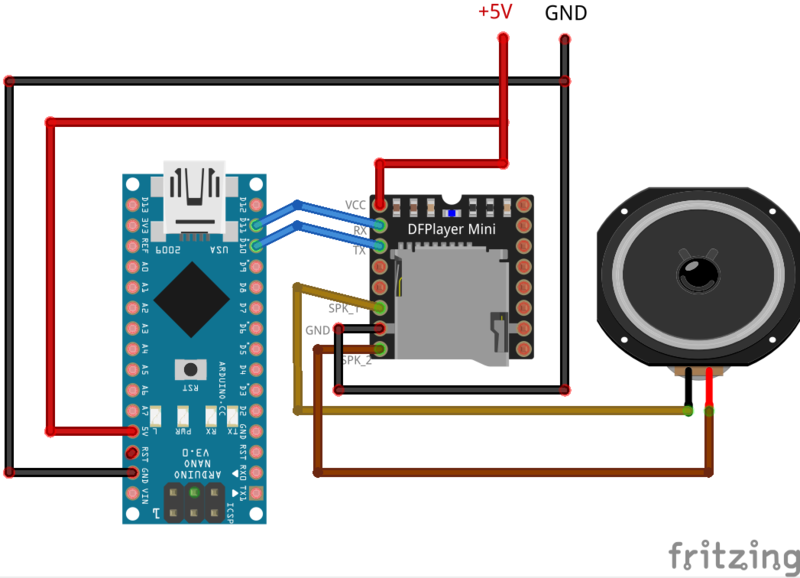 Reading the comments in the example sketch of the DFPlayer library, I assumed that the digital RX/TX on the arduino nano goes to the same corresponding RX/TX on the DFPlayer. This is not so! Valuable lesson about serial connection, digital RX (pin 10 in my sketch on the arduino) should be connected to TX on DFPlayer, and digital TX (pin 11 in my sketch on the arduino) should be connected to RX on the Dfplayer. Mac computers litter the sd card with lots of unneccessary dot files, that can cause problems with dfplayer (also with catalex mp3 serial player, for the record). What helped was following the tips from https://reprage.com/post/dfplayer-mini-cheat-sheet . If you don't want to remove it via terminal every time, there is also software like "clean my drive" for this mac-software-generated problem. A bad karma situation: My cheap asian arduinos caused long debugging pain. I had to power my Cheap Arduino Nano (CAN) and the DFPlayer through an external power supply -for some reason the whole setup would not work when powered through my trash-CAN. Before uploading code, I unplugged the external power supply, after uploading I unplugged usb and plugged in the external power supply. For some reason, serial port communication would be fine when first powering the whole setup through the external power supply, connection the CAN via USB only afterwards. Fun and games. But now it works.